A life hack tool, The Cut Buddy makes cutting your hair and beard a breeze! The brainchild of Joshua Esnard, he had originally come up with the idea back in 2000—when he was just thirteen years old. Tired of making errors while cutting his own hair, he found himself wanting to make something that would make things easier. In the end, it wasn’t until 2015—more than a decade after he created his first stencil, that he perfected the tool, one that would later be called The Cut Buddy. Over the years, he had tested the product on not only on himself, but on his uncle, brother, and friends as well. Ultimately, his hard work paid off; by the end of the year, he had created something that was usable for any head size or hairline shape. Within just a few months of its development, the product began to gain traction. As it had happened, a YouTuber called 360WaveProcess had posted a tutorial on how to use The Cut Buddy, which led it to go viral. Before long, orders were pouring in. While this was good news, however, he soon found himself struggling with a depleted inventory. Pleading with his manufacturer, he eventually managed to get more units after paying upfront. Not long after that was solved, however, he began to face other issues. Disgruntled with their lack of product, many customers threatened to sue, which led both his Paypal and bank accounts to be frozen. Fortunately, with the help of his friends and family, he was later able to remedy the situation (he offered each customer two options—either he would offer them a full refund or he would double their order if they were willing to wait). With time, the business took off. In fact, they managed to sell over 55,000 units by February 2017. Later that year, he would go on to showcase his product at both the Black Enterprise Entrepreneurs Summit and the Broward College’s conference. 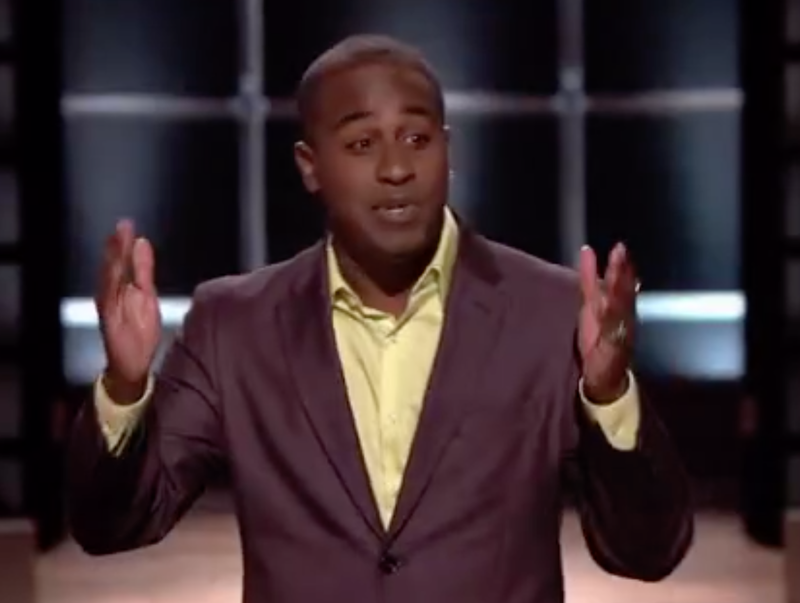 Fast forward just a few more months, and it was announced that he would be pitching his product on the popular ABC reality show Shark Tank. The episode eventually aired on television on November 12, 2017. Walking into the set with two companions, Esnard introduces himself as the inventor of The Cut Buddy. As the camera pans to the product, he tells the sharks that he is seeking $300,000 in exchange for 10% of his company. Offering to give the sharks some samples, he walks up to the panel and hands each of them a box. Upon receiving it, Lori immediately comments on the character on the box, which Esnard proudly states was created by himself—along with the packaging. From there, she asks the inventor to tell them his background. An immigrant from a developing country, he states, he and his family had moved to the U.S. during his childhood. Tired of getting the buzz cut, he had decided that he wanted to cut his own hair in middle school. Despite giving it his best shot, however, he found himself prone to messing up. Wanting something to help with his haircuts, he eventually began to design his own tools. Not long afterward, he put together his first template at the age of thirteen. Told that he had sat on the invention for many years, Robert asks what had caused him to start the business. Answering, Esnard states that it all started after he was told by his girlfriend that he never finishes what he starts. Realizing that he had left The Cut Buddy unfinished many years ago, he decided to go back to the project. 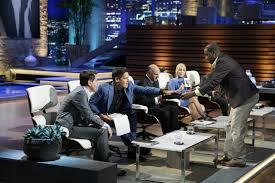 Afterward, he tells the sharks that the product does have a patent. Asked about the time frame between him developing the product and him being on the show, Esnard states that his company has been open for business since January 2016. Noting his $3 million valuations, Kevin eventually inquires about his sales, to which he tells him that he made $700,000 in sales in 2016. Amazed, Daymond wonders how it’s possible to sell that many units. Revealing his secret, Esnard says that he had found and collaborated with a few YouTube affiliates “with a heavy following.” Just like that, he explains, his sales had significantly increased—from 20 sales a day to 400 a day. Before he knew it, he had gone viral on Facebook and had hit 11 million views. With that, Robert asks the inventor how much he sells the product for. In response, he tells them that they sell for $14.95 and that its production costs are $2 each. 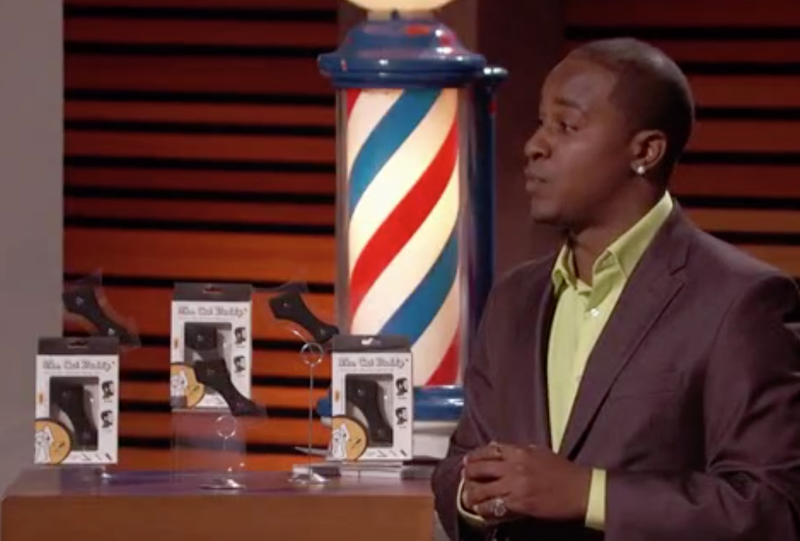 Next, Daymond inquires as to whether or not the product is available at retailers. Replying, Esnard tells him that he had just recently met with Sally’s and is currently waiting for them to offer him a purchase order. Continuing, he also states that Target and Walmart had brought them on as a dot com, though most of his orders are directly from his online website. Recognizing what he’s managed to accomplish already, the shark asks him what he needs them for. Jumping straight into answering, Esnard tells them that their mentorship would be extremely valuable for him as the inventor. As Daymond is just about to continue talking, however, Kevin makes him an offer—he is willing to give him $300,000 for a $1.5 per unit royalty until $1 million is paid, as well as 5% stake of the company. As Esnard ponders the offer, Mark tells him that he’s out, which leaves him with three sharks. While he admits that it’s a nice product, Robert eventually also drops out. Telling them he believes that The Cut Buddy will become the next comb, he tells them that his product has already been knocked off over 700 times. Noticing that Daymond has been silent, he asks him whether or not there is any chance that he’s willing to work with Kevin. 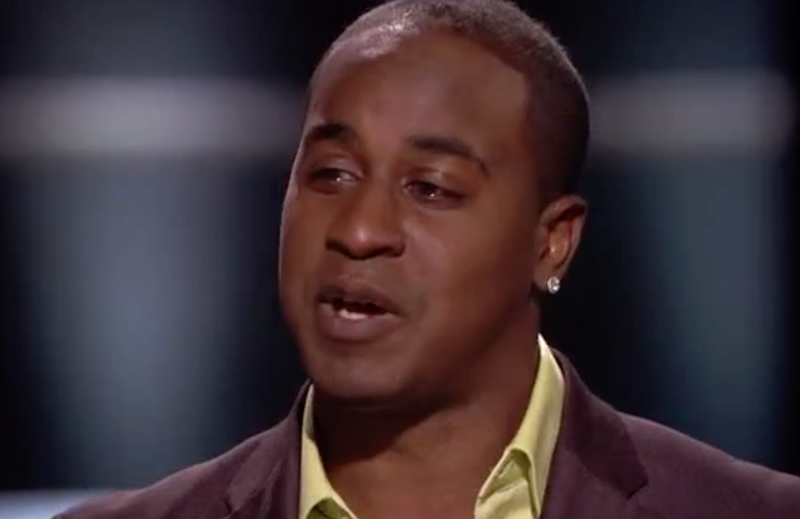 Scoffing at that possibility, Daymond reminds him that everything will be changing the moment he becomes a dad (his fiancé was due to give birth within a couple of weeks at the time). Nodding in acknowledgment, the inventor is back to considering the two offers. Attempting to make a counteroffer, Esnard asks if Daymond is willing to go down to 12.5%. Reminding him that he has already lowered his offer from his regular 33%, he tells him that there isn’t much he can do. Asked to make a decision, Esnard is noticeably conflicted as he weighs his options. After some brief contemplation, he reveals to everyone that he’d like to partner up with Daymond. Congratulated on a job well done, the two embrace for a short hug before Esnard begins to walk out. With a pat on the back, Daymond tells him that “he’s going to be a good dad.” Thanking the sharks one last time, he begins to walk out of the set. With a smile on his face, it’s obvious to viewers that he’s excited about the work opportunity with Daymond. 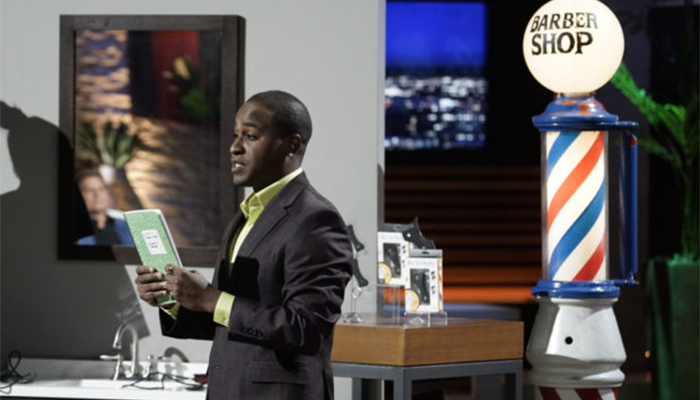 As of July 2018, more than half a year has passed since Esnard pitched his product on Shark Tank. How is he doing nowadays? According to a recent interview with the inventor, there have been huge changes since the episode aired on television. Not only have they now sold over 100,000 units, but they’ve also managed to secure a licensing deal with the grooming giant And is Clipper, Co. A big opportunity for the company, The Cut Buddy will soon be made available in retail stores across the country, including some big-name stores such as Target, Sally’s and Walmart. 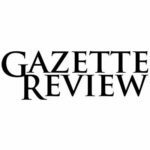 Not only that, but the product has since also been made available at retailers such as Touch of Modern, Zulily, T.J. Maxx, and Burlington, along with in-store pickup for Walmart and Target. This upcoming November, they will also be partnering up with Birchbox Men for their November Survival Kit. Over the past several months, thousands of units have been sold across the country. On Amazon alone, The Cut Buddy has received over 500 reviews—for an average rating of 4 stars. Reading through some of them, it’s obvious that most users are satisfied with the product, whether they’re using it for their beard or hairlines. In fact, many professional hair stylists have also praised the tool. Similarly, on Facebook, The Cut Buddy has received a number of rave views on the product’s official page. At the time of this writing, the product has a 4.8-star rating, out of 57 reviews (less than 5 are four-star or lower). Unsurprisingly, the company has built up an impressive presence on social media over the past little while. For instance, on Instagram alone, The Cut Buddy has gained more than 12,000 followers. In a similar fashion, they’ve since also earned over 11,000 followers on Facebook. As far as other things go, more and more individuals have also been featuring the product on YouTube, which without a doubt, helps with publicity (after all, that’s how they went viral in the first place!). Will Esnard be returning to Shark Tank for an update anytime soon? Unfortunately, nothing has been announced as of yet—it might just be a while before we see him return to television.